it seems Neolithic farmer in Scandinavia was closer to southern europeans like sardinians and basques. the modern Cypriot population seems closer to other middle-easterners found eastwards than any typical european population. Yeah, it's because of recent West Asian admixture in Cyprus. But the Cypriots are still ancestral to the Mediterranean farmers, despite being admixed with later influences. 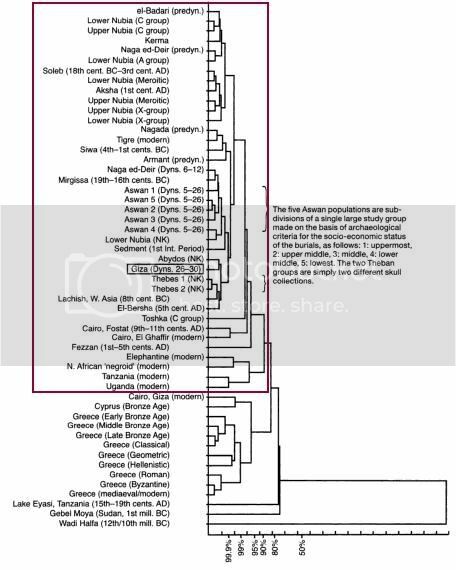 This cranio-facial dendrogram puts Bronze age Cypriots near modern North Africans/Egyptians, closer to them than to modern or ancient and Byzantine Greeks. Dienekes just blogged about the "lack of West Asian" in Basques. But I think he just worked out that they don't actually lack it, they just have less of it. 42 of 44 Z-scores are negative and significant, suggesting that most IE-speaking West European populations are West Asian-admixed relative to non-IE Basques. So he's making progress. Good to see. Now if he would only realise that the Basques have less West Asian not because they don't descend from the early Indo-Europeans, but because of the fact that they lived in the mountains and kept their own language, so that mixing with their Indo-European-shifted neighbors was more difficult. In other words, cultural and geographical barriers = less West Asian. Last edited by Polako; 2012-09-10 at 03:35. ... while modern Northern Italians are 21.4% K12a Caucasus, and modern Swedes have 1.1% Caucasus (I guess K12b numbers are similar, but I don't have time now to check it). I don't see any post-neolthic invasion from Cuacasus here ("West Asian" peaks in Caucasus, so it's name is misleading). To be honest I never fully understood Dienekes' argument. Oetzi as 22.3% K12b Caucasus, while Gok farmer 4.2% K12b Cuacasus. His argument doesn't involve that particular Caucasus cluster, but another, related cluster from a different K (7 and/or 8). He calls it West Asian, and I think it's basically like half of the Caucasus, because the other half splits into a cluster he calls "Southern". But his argument is very naive for a number of reasons, including that these sorts of fleeting clusters, that flash in and out at different Ks, can't be used as solid, unambiguous signals of an ancient ancestral group. They usually mean somewhat different things for different groups that show them, because they're very noisy composites. Also, we now know that programs like ADMIXTURE often won't show such influences in some samples, even though they should, because they do carry the required alleles, it's just that they carry relatively less of them. In other words, Basques do have that so called West Asian influence, but ADMIXTURE deems it as not important enough to actually show it, for whatever reason. At a different K, the Basques do end up showing Caucasus influence, and sometimes even more than many other Europeans, depending on how the test is designed. Like I said here before, there's something East Eurasian about that particular West Asian cluster. I think it's just a version of the so called Southern cluster from the same run, but with East Eurasian and maybe North European influence. Many samples carry it just because they have that mix of alleles from way back, and not because of any particular Bronze Age movements. Edit: Actually, Basques show "Gedrosia" in Dienekes' K12b, which he touted as an Indo-Iranian signal. So how come Basques have Indo-Iranian ancestry, and no Indo-European ancestry? I might look into this controversy in a formal way, but it might take a while, because I'd have to cover all bases. Last edited by Polako; 2012-09-10 at 09:53. So this West Asian admixture in Balkans could be Post Iron Age admixture. It could be partially due to Greek colonization or admixture with Anatolians during Roman and/or Byzantine times. It could be a lot of things, linked to either or both the way ADMIXTURE works and more recent movements within Europe. I'll write up a blog entry this week commenting on it. I'll also try and reproduce it using STRUCTURE, and see what happens. STRUCTURE doesn't lump as much as ADMIXTURE, so we might be able to see what's behind this "West Asian". Dienekes Pontikos’ West Asian cluster: a genetic signal of the Bronze Age invasion of Europe by the Indo-Europeans? You need more Balkan samples especially Albanians since there is not a single participant. Recently a Kosovo Albanian posted his 23andme results here. I said to him to participate at your project but apparently he doesn´t know what(raw data) and where to send. i want to participate in this project, i have results from 23andme, im from Europe, Kosovo. Whom do i send my results to and how do i get GEDresults? 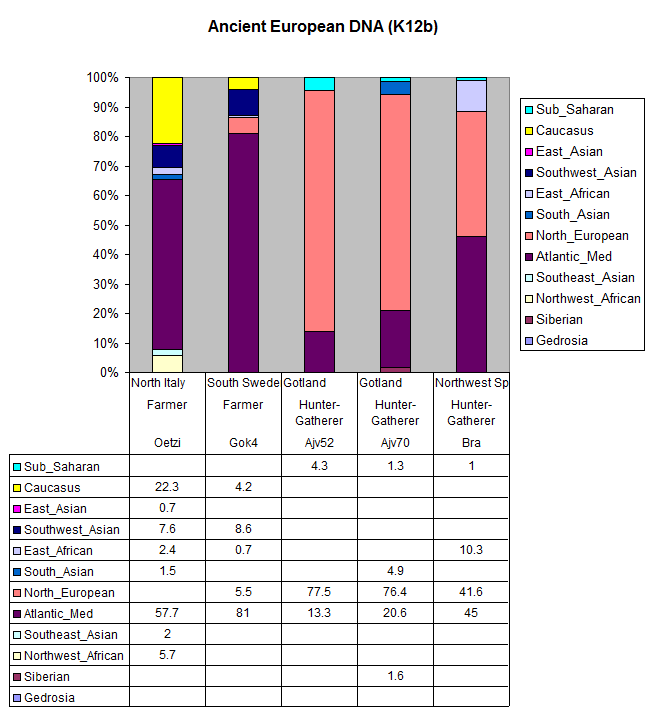 From the greek autosomal results that i ve seen so far there isnt much variation of the quantity of the west asian component in comparison to others like north european for example.With my limited genetics' knowledge i interprete this fact as the result of good mixing in the greek gene pool that has to have taken place long ago.Also even with my greek matches i dont match on west asian segments probably because they got too small after the thousands of years that are in the greek gene pool. Central American/Southern Mexican and Southeast Asian/Pacific Islander? do Southeast Asian men look feminine or not to you?